Paperback, with flaps, 736 pages, 13.5 x 20.6 cm, 5.3 x 8.1 in. Sahif used to be a Shadow, a master Assassin. But that is just about all he knows about his former life after his accident. While fleeing from his half-sister's sinister intrigues he finds out that the woman he loves and for whom he was going to denounce his ominous calling is somewhere very close to him. It isn't until it is far too late that he realizes that he has been taken in by a malicious lie. For the woman who looks at him with radiant eyes and swears love wants only one thing – his death! 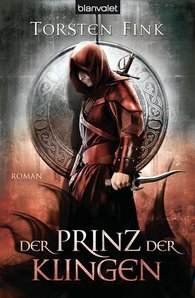 The Sequel to "The Prince of the Shadows". Perfect reading matter for the fans of Brent Weeks and Peter V. Brett.